Pursuant to the General Data Protection Regulation ("GDPR"), We adhere to the Privacy Shield Principles. All personal data We receive from the European Union ("EU") are subject to the Privacy Shield Principles. Additionally, all of Our entities and subsidiaries also adhere to the Privacy Shield Principles. We collect personal information about and from You that is necessary for Us to provide You the services that You request, to help serve Your needs, to make customized offerings of Our products and services for You, and to fulfill legal and regulatory requirements. Both the amount and type of information collected will be limited to that which is necessary to fulfill these purposes. The purpose for collecting this data is to provide You the products and services You requested from Us. We collect and hold Your information as long as reasonably necessary to give effect to these purposes. We currently collect Your name, email, and country when You create an account on Our discussion forums. 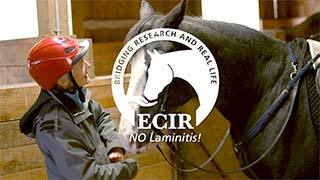 By creating an account, or purchasing a ticket to Our NO Laminitis! Conference, You gave consent for Us to contact You regarding Our discussion forums and/or event as part of Our commitment to customer service. If You opt-in to receive marketing emails from Us, You voluntarily consent to receive such messages. You may contact Us regarding this use at anytime using the contact information below. These messages may include information about future conferences, surveys, equine-focused research and information, fundraising events, and/or other related topics. We shall keep Your information on Our mailing list until You withdraw Your Consent. You may opt out of receiving these messages at any time. We do not share this information with any third parties outside Our organization, except as stated below. ECIR outreach discussion groups maintain the ECIR library as a convenience for members to voluntarily store support information for discussion concerning the animal(s) in their care. You are solely responsible for the removal of any personal identifying information on lab results, hay analysis, radiographs, photos, or the like, that You submit. Participation in surveys is completely voluntary. Survey results will be used to understand the needs of Your equine(s), and to monitor or improve Your use and satisfaction with Our services. On Our discussion forums, We ask You to provide Your general location in the "signature" section of each post. The location of an equine can impact how the animal is affected due to seasonal changes and what feeds, medications, supplements, and other products are available. This information helps You obtain more effective information for Your equine and obtain beneficial information from similarly situated equine owners and caretakers. ECIR may, from time to time, use aggregate equine information submitted to Our discussion forums for published research and articles, including information in the case history database (or website). All data in the ECIR case history database is stored in a password-protected electronic format. To help protect Your confidentiality, research data reports will not contain personally identifiable information, except in the rare cases where We have asked and received specific written permission to do so. The results of these research reports will be used for scholarly purposes only. Unless You opt-out of cookies, Our cookies from Google Analytics track Your IP address and activities on and interactions with Our Site. This information is anonymous or pseudonymous. The Site may also collect anonymous aggregate "traffic data" (contains no personally identifiable information about individual Users) that may help Us improve and market Our services. We may share aggregated demographic information from cookies and other sources with our members, benefactors, potential donors, and advertisers. This information is general in nature and is not linked to any personal information that can identify any individual. We share personal information about You, as required or permitted by law, with third parties, such as service providers, who assist Us in the day-to-day operations of Our organization. We require third-party service providers to enter into confidentiality agreements with Us, prohibiting them from using any personal information they obtain for any purpose other than those for which they were retained or as permitted by law. We will not share or sell Your information with other third parties without Your explicit consent except as stated herein. We may share Your information with a third party if We have a good-faith belief that sharing the information is necessary to comply with a law, regulation, or enforceable government request including court orders; to investigate potential violations or technical issues on Our Site; or to protect against harm to Us, Our users, or Our affiliates' rights, property, safety, or to the public as permitted by law. We are a U.S.-based company. When We transmit a person's personal information from overseas, We will only do so with Your consent to the transmission or otherwise in accordance with the applicable privacy laws. Making a donation or making a purchase requires that You provide certain personal information about yourself, and doing so is an expression of consent to Your personal information being sent overseas as part of the transaction process. Pursuant to the GDPR, We use reasonable efforts to comply with the requirements of the EU-US Privacy Shield. At any time, You may request that We update, correct, or delete Your personal information, and We will comply with such requests as permitted by law or contract. You may also request a copy of the personal information We have for You and information about how We are using it, and We will comply with such requests unless We are required or authorized by law to withhold such information. Under California Civil Code §§ 1798.83-1798.84, California residents may ask Us for information about the categories of data We collected about them and shared with third parties for marketing purposes in the preceding calendar year and provide the contact information for those third parties. If You are a California resident who would like a copy of such information, please send Us a written request using Our contact information below. In accordance with the GDPR, EU residents may, under certain circumstances, invoke binding arbitration to resolve a dispute regarding Your personal information. Additionally, You may lodge a complaint with the appropriate supervisory authority at any time. We have internal policies and procedures designed to protect Your personal information, including protection from unauthorized use or disclosure. We have implemented physical, electronic, and procedural safeguards to maintain confidentiality and integrity of the personal information in Our possession and to guard against unauthorized access. These may include, among other things, procedures for controlling access to User files, building security programs, and information technology security measures such as the use of passwords, firewalls, plus virus and use-detection software. We continue to assess new technology as it becomes available and to upgrade Our physical and electronic security systems as appropriate. Please contact Us with inquiries or complaints or to request access to, or correction of, Your personal information held by Us at ECIR Group Inc., 2307 South Rural Road, Tempe, AZ 85282 or privacy@ecirhorse.org.